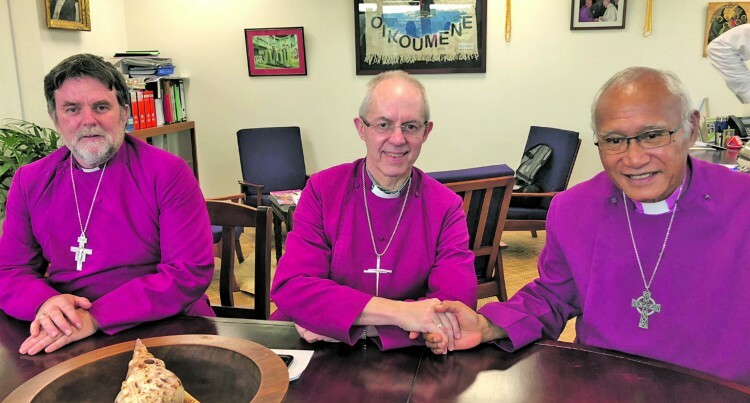 The Most Reverend Justin Portal Welby, the Archbishop of Canterbury, said he jumped at the invitation to attending this year’s Oceania Anglican FONO here. “I want to understand the context of Oceania and particularly better understand the issues facing the mission of the church,” he said. “So I come to share and listen with my brother Primates with all those who gather for the FONO. “We will be listening much more than speaking, when we listen, we hear voices of the vulnerable, whether in the natural creation or amongst human beings and small Islands states that are deeply vulnerable to climate change. “So I think we will have to be listening and considering and reflecting on the Anglican communion worldwide. “Particularly with Commonwealth Heads of Government Meeting (CHOGM) coming up in London, we can put forward ideas, bridge ideas that enables reconciliation between the welfare part of the world and the poor parts of the world. “Between the strong self-sufficient state and the ones that are poorer and vulnerable to climate change especially in the Pacific. “We will hear those voices. “The Anglican communion is the communion of reconciliation,” Archbishop Welby said. “I think my prayer for this is that we have a clear and creative message from the Pacific to take to CHOGM. The Most Reverend Archbishop Winston Halapua, Primate for Anglican Church in Aotearoa, New Zealand and Polynesia described the FONO as a time to connect with Nature. “When we speak, we try to listen to the environment, that is the abundance we have missed for years,’’ Archbishop Halapua said. “Now when we look at the corals, all the marine species, the waves and the desert move up and say hey we can speak for you, isn’t it wonderful? “FONO is a council where when we make a mistake, we use western concepts with philosophy. “When we talk about FONO, the sun speaks, the moon dances and when you look up you can’t count the stars. He said when the Archbishop of Canterbury drank the yaqona yesterday, he drank the hospitality of this part of the world. “FONO is the whole creation talk, dance, and hear voices. “The most important thing is to deeply listen. Otherwise, there is no conversation. “So when we say Oceania FONO, we say, we come together with the waves of the ocean, the stars, the moon and everybody, but can we hear their beauty?” he said.